In my limited spare time these days, here's what I've been up to. 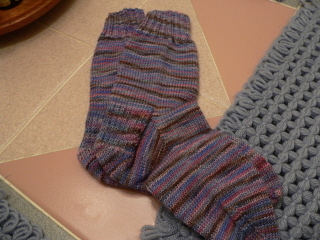 I finished a couple of pairs of socks. Why I can't get an accurate picture of these colors is beyond me. 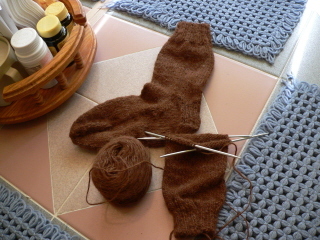 These socks are green and brown. I'm working on some handspun projects. 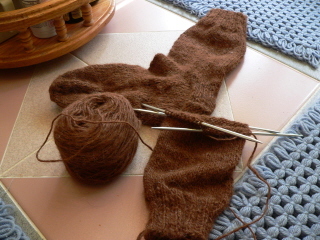 I'm knitting socks with alpaca yarn I spun. The fiber is from animals raised here on Long Island. I've been working on a scarf with various yarns spun from fibers I either bought at Rumpelstiltskin or directly from Tabithia at the spin guild. Fibers vary; dorset wool, llama, alpaca and mohair. 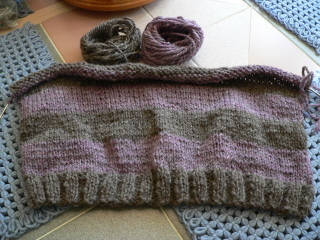 I've started a sweater with the yarn I spun from the gray coopworth and the purple fiber from Rumpelstiltskin. 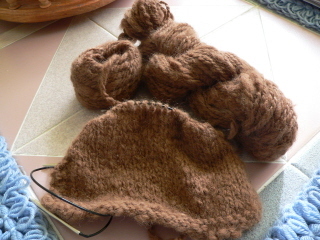 I have about equal amounts of both yarns and together, it's enough for a sweater. I shouldn't be starting anything new when I'm still trying to finish up all the projects I have going already but it's hard to resist. Sigh. I'm so weak. Wow, it's not quite that warm yet! Although this wasn't much of a winter, it's still chilly out there. It's also very windy. After the last couple of days, if the rain had been snow, we'd be buried by now. Yikes. 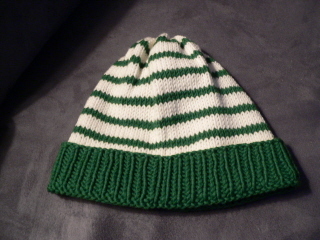 Recently, I made a hat for the St. Baldrick's event in Northport this weekend. St. Baldrick's is a combination of St. Patrick's and the word bald, as in shaved head. Go read about this organization. 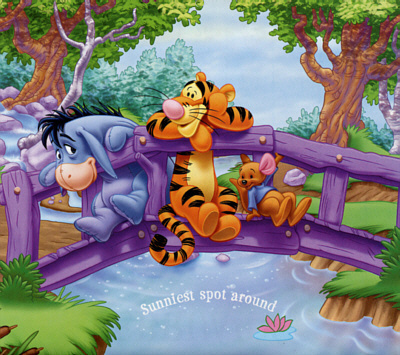 It's really amazing. Local knitters knit hats so the "shavees" don't have to go home feeling the cold. I picked up the yarn at Knitter's Therapy, a little shop in Northport. 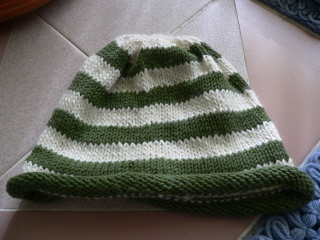 For a five dollar donation, you got two balls of yarn and then gave them the finished hat. I really enjoyed knitting this. I made another one with yarn I had. Unfortunately, I didn't have any available time this week to bring the hat to the shop. It's a cute hat, though. Someone will use it, I'm sure. ASL class just started again. It was a weird situation. I got a message that the class was cancelled on a Thursday and on Friday, got another message that they had some late signups. Sigh. I believe there were only two signed up and by the time Monday rolled around, there were eight, although two dropped out before the class started on Monday evening. So, final tally is six. Seems like a good group so far. Here's the first of the spun yarn from Joshua's fleece. It's a bit lumpy but it's bound to improve over time. My spinning is improving by leaps and bounds. I'm finally getting enough twist in thinner singles. I'm not quite sure how I'm doing this. I think it's just experience making a difference. 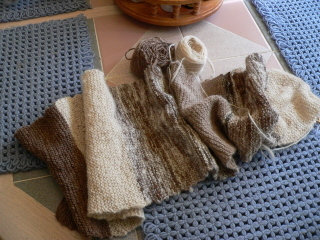 This alpaca is so soft and I can live with the handspun look. That's fine as long as the finished product is warm and soft. I'm spinning some white coopworth, white finn (also incredibly soft) and I'm going to finish spinning these wools before continuing with the superwash merino and the fiber in the red colorway. By that time, I should be worthy of these beautiful wools! 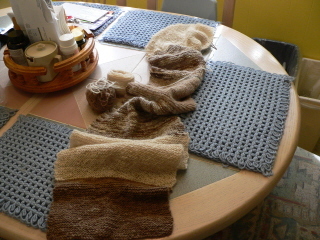 I have finally finished knitting all the pieces of the gold cardigan! Now, how many bets on how long it will take for me to sew the thing together? I also knitted up a cardigan on the knitting machine. 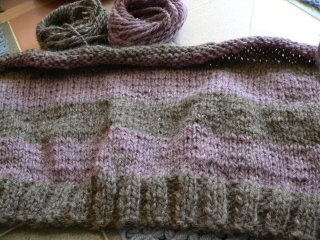 I messed up the row gauge on my swatch, however, and it's longer than I intended it to be. I'll see how it looks when sewn up but I'll probably finish it. I can wear it around the house if I really think it looks wacky. I have two huge cones of donegal tweed yarn, specifically for knitting machine knitting. Two sweaters right there. 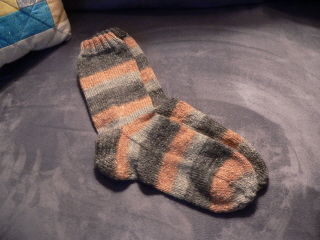 Now, I just have to find time to knit them. So, I'm progressing. Spring is near and we changed the clocks last night. Earlier than usual, right?